Hi! 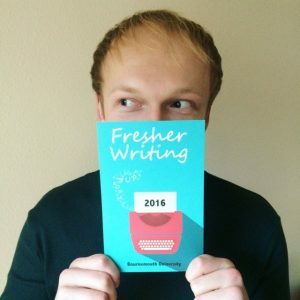 My name is Wesley Schulte, the publishing assistant for Fresher Publishing, and I’m here to give you an update of all the wonderful things that are happening behind the scenes! I’m a second year BA English student, from The Netherlands, and interning for Emma Scattergood, editorial director of Fresher. At the moment, we are busy promoting our writing competitions; flyers are flying around, writing groups are being emailed, local libraries researched, tweets beings tweeted, anything to reach as many aspiring writers as possible. The reason I put ‘aspiring’ there is because that’s one of our main aims here at Fresher. As an aspiring writer myself, I think it’s great that there is a competition out there that focuses specifically on new writers. Sure, winning a writing competition is always a great thing to show off to agents, but it’s not a necessity. What’s so nice about Fresher is that the prizes are actually worth something. They provide a platform for you where you can show off your work and receive feedback from professionals in the industry; even allow you to potentially start building a network. I think that’s why we like to refer to our competition as the Fresher Writing Prize, because it’s not about competing. Considering the prizes that we offer, we’re very reliant on collaborating with writers, editors, and publishers, and it’s amazing to see that there are so many professional individuals who are happy to give up their free time to broaden and support the writing community. So, if you’re a little hesitant about entering, take it from an insider who has the same ambition as you: just do it. Allow yourself a chance to let Fresher launch your writing career.